Well don't you just feel the urge to jump through this computer screen and give me a big ole kiss? 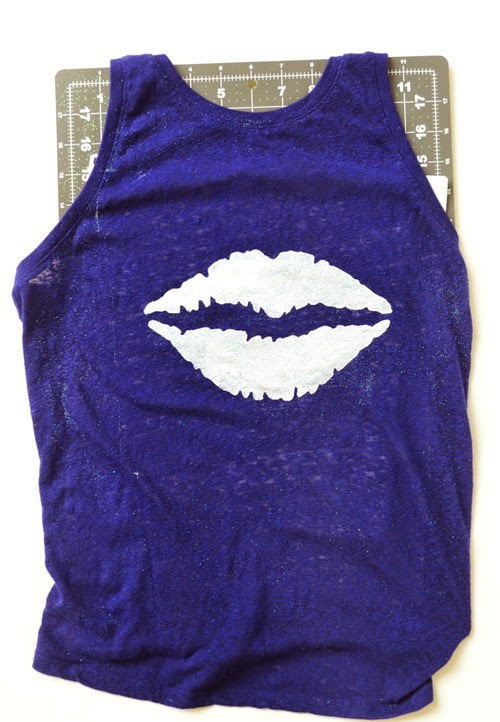 I am totally in love with all of Tulip's stencils but especially these big pouty lips! I have been seeing a lot of lips lately so I wanted to put my own twist on them. I love that they look like a silk screen, minus all of the work. 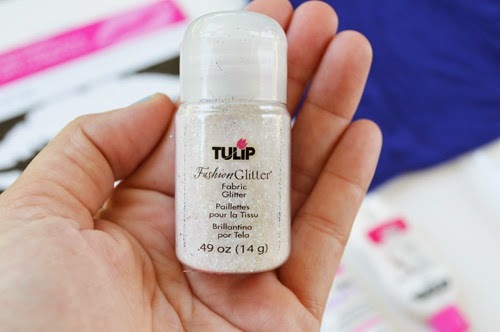 I want to start off by telling you about Tulip's fashion glitter. 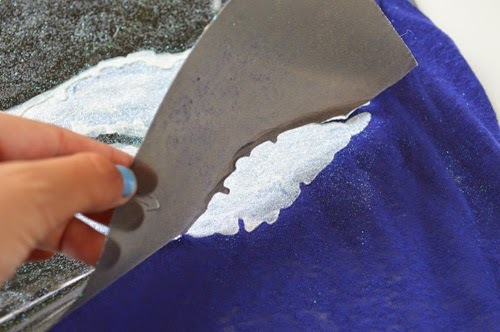 I have used this a few times to add a "little" sparkle but I have never used it to cover a large area. 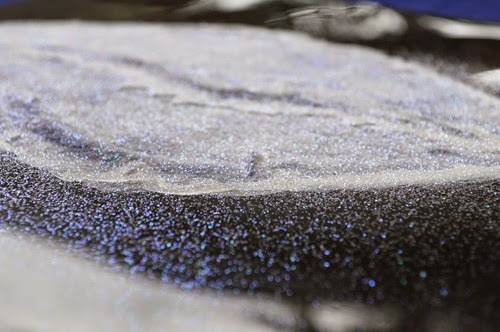 I have to tell you how beautiful this glitter looks on fabric. I kinda wanted to eat a little, shh. Step ONE: Lay your shirt out on a flat surface. 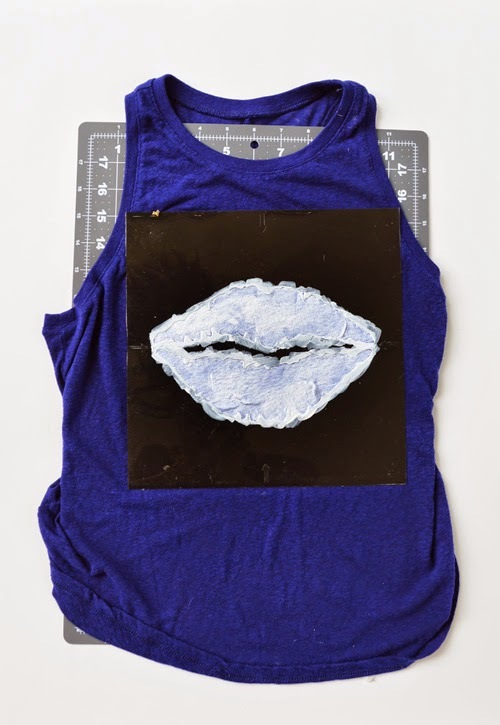 I recommend placing something in between the shirt so the paint does not stick to the back. You can put a piece of cardboard in between if you want but I used a cutting board. 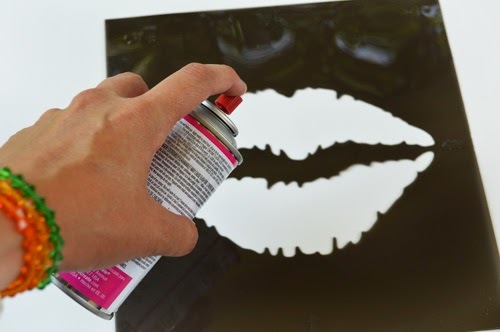 Step TWO: Spray the back of your lip stencil with a light coat of stencil adhesive. I suggest spraying the back and letting it sit for a few seconds before placing it on your shirt. Don't worry, if you place the stencil and it's crooked you can pull it off and re-apply it. 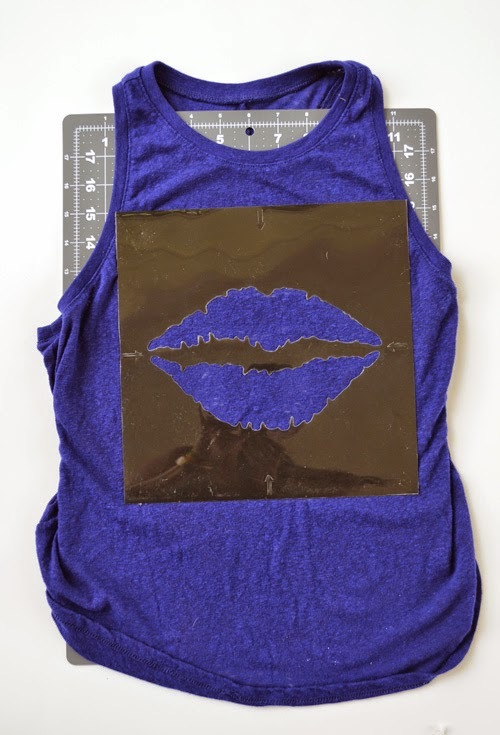 Step THREE: Place the stencil on your shirt. 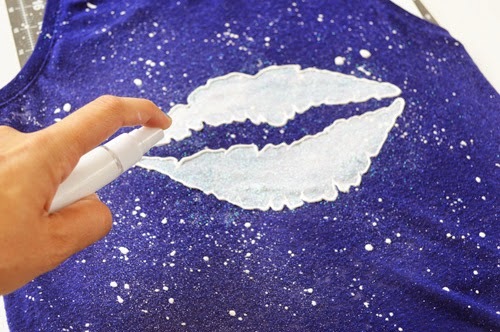 Step FOUR: Grab your white fabric paint and fill in the entire stencil. If you are using a dark shirt you might need to put two or three coats. It all depends on how light or dark you want your white paint. This is 2 coats, but I added one more. 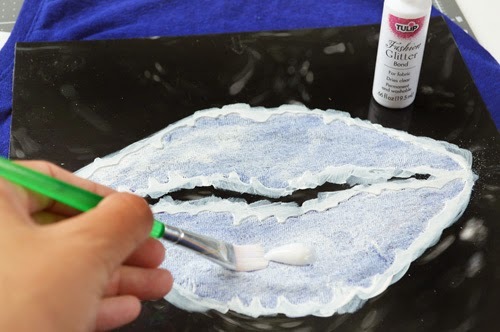 I also suggest letting each layer dry before adding another. You will get better coverage doing this. 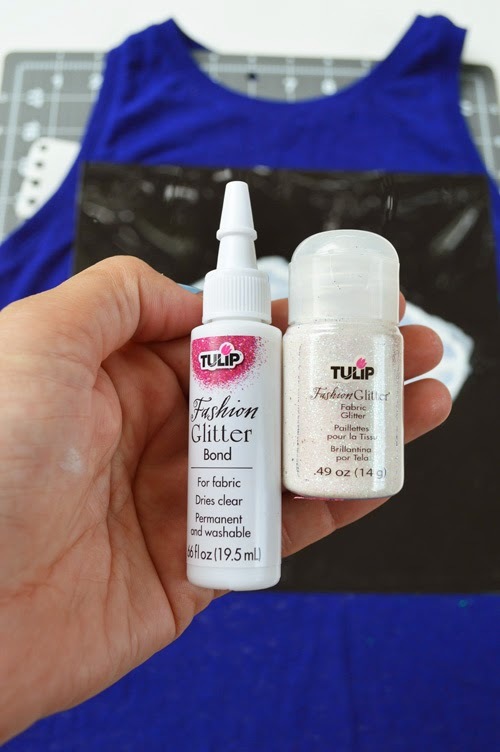 Get your fashion glitter bond and fashion glitter out, it's time to start the party! 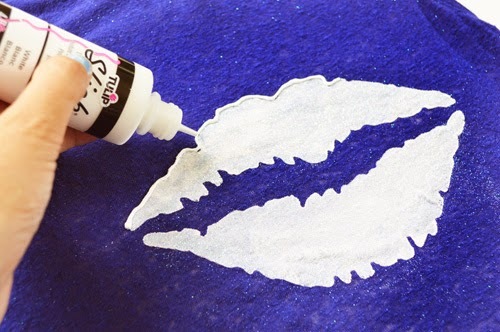 Step FIVE: Apply a thin layer of your glitter bond onto the lips. Notice I have not removed my stencil yet. I want to remove it when I am completely done working on it. This will help with paint or any liquids bleeding out of the sides. I love how shimmery this glitter is. Some angles it looks blue and some it looks clear. 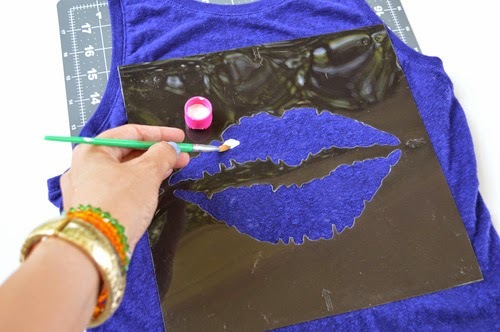 Step SEVEN: Wait about 2 hours for everything to dry then carefully peel off your stencil. 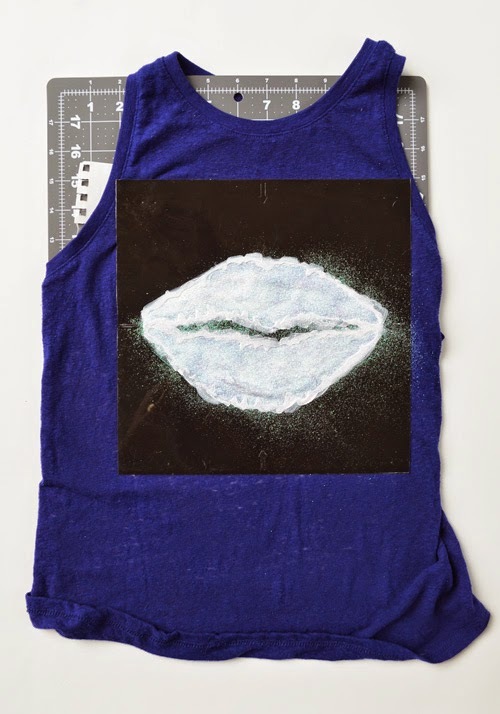 Step EIGHT: Outline your lips with dimensional paint. Be careful not to squeeze the bottle too much because a big glob will come out! We don't want that! 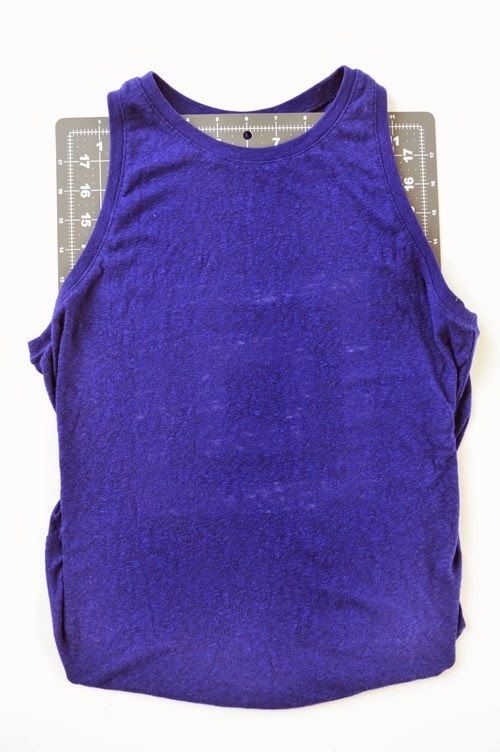 Step NINE: Start spraying your fabric spray paint all over the shirt. If you press down really hard you will get a light misty spray but if you slowly press the sprayer large clumps will come out. I love this part! 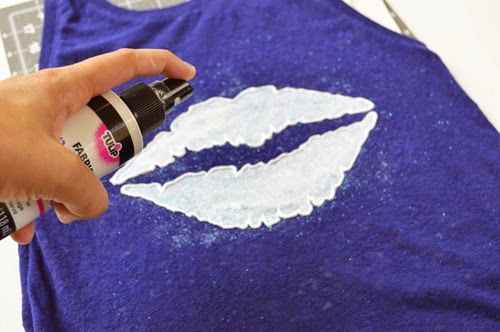 Step TEN: Lightly spray your glitter spray on top for that FINAL touch! I am so happy with the way it came out. 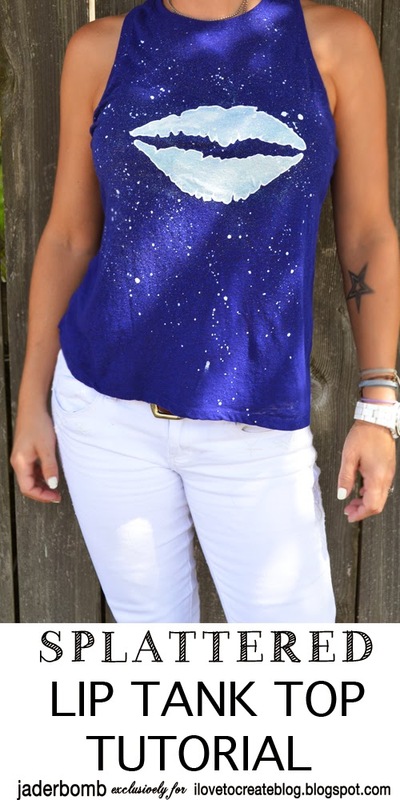 I want to say that in person the glitter is so bold and shiny! It's kinda hard to tell because of the reflections from the sun. BUT... in the sun it looks just like Edward Cullen. Pinky Promise! I hope you enjoyed this tutorial because I did! Make sure to check out the whole line of Tulip stencils. They have so many to choose from and I am certain you will find one you love!